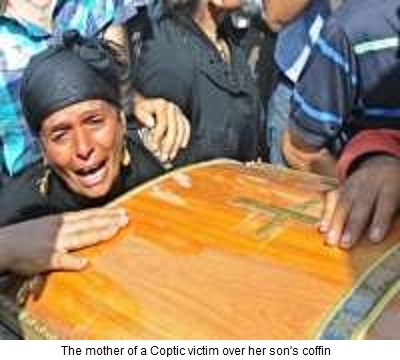 (AINA) -- The Coptic Orthodox Church in Egypt issued a statement on October 10, expressing horror at the events of yesterday in Maspero, where 24 Copts were killed and over 200 and wounded. The church stressed that the Christian faith rejects violence. The church blasted the government for failing to find solutions to "problems that occur repeatedly and go unpunished." The Church asked all Copts to fast continuously for three days starting tomorrow "in order to have peace in Egypt." Some interpreted this demand, which the church has made only three times in its long history, as a way to implore "God's help for the Copts," commented Coptic activist and writer Nader Shoukry. 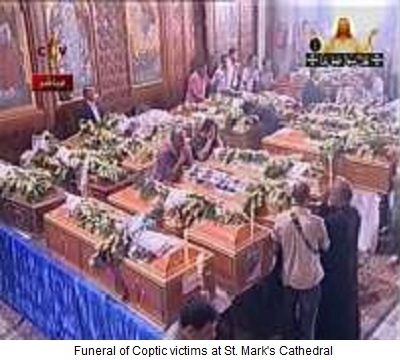 A funeral service presided by Pope Shenouda III was held for the Copts killed in Maspero, at 11 AM at St. Mark's Cathedral in Abbasiya, Cairo, and was attended by over 10,000 Copts. The funeral was for five Copts only, as the rest of the victims are awaiting for autopsies, on the advice of Coptic lawyers. "This is to safeguard the rights of the dead," said attorney Dr. Ehab Ramzy, "otherwise the families could lose their case. We need proof." After the funeral, while still inside the Cathedral, the enraged Copts chanted "down with the junta rule and down with Tantawi." The families insisted on having the autopsies done, which were carried out on 17 bodies lying in the Coptic hospital. Independent doctors observed those who came from the Public Morgue to carry out the autopsies. Dr. Maged Lewis, a director at the Forensic Medicine Institute, commented that he had never seen corpses in this deplorable state before. "Bodies were mashed and bones were crushed; many had fractures and laceration of the intestines; while in others, death was caused by gun shots." Eyewitnesses reported the army disposed of nine bodies by throwing them in the Nile. Two bodies remain unidentified, making the number of killed uncertain. After midnight today, friends and relatives of the dead carried the 17 caskets from the Coptic hospital to St. Mark's Cathedral for the second funeral service. Near Ghamra bridge, bricks were hurled at the cortege, but the procession carried on to the Cathedral. 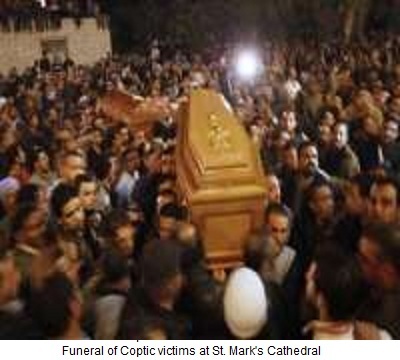 The caskets were taken to St. Mary's Church in "October 6" district, where they laid beside the 12 Copts who died in Embaba, defending their Church against Salafist attacks on May 7, 2011 (AINA 5-8-2011). The Coptic Church considers people who lost their lives on account of being Christian as "martyrs" and they will be buried together in a collective grave.